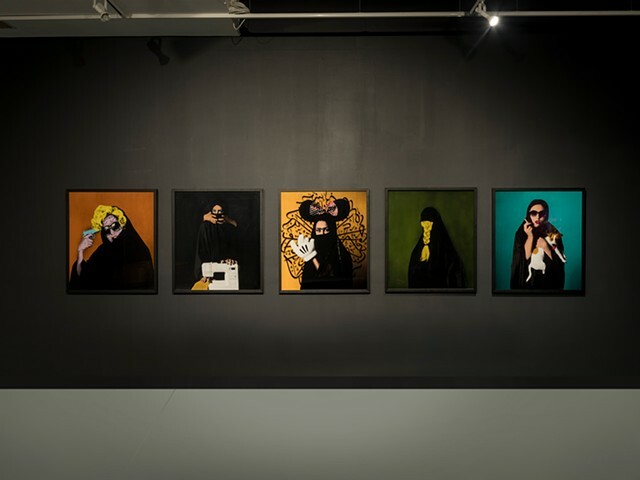 Under Western Eyes (2013-2014) is a series of manipulated studio photographs that combine, in pop-art style, familiar signs of Islamic identity to challenge the dominant representations of Islamic women that circulate in Western art galleries. Through pastiche and redeployment of these familiar signifiers, this series attempts to locate the origin of these representations, and the reason for their predictability, in the Western gaze. Thus, these images aim to critique, through mirroring back, a certain audience expectation and desire in relation to how ‘the female Islamic subject’ is seen; for it is this expectation that partially explains the recurrence of the same few signifying elements in the works of Middle Eastern artists—above all the veil. The central idea, then, is that such (self) representations often depend on, and thus re-produce, familiar signs of ‘otherness’ that cater to Western viewers’ and the art markets’ demand for ‘Islamic’ artworks that highlight their cultural difference in safe and predictable ways. At the same time, such representations also serve to position the Islamic subject in relatively fixed ways vis-à-vis the ideal type of Western viewer. She is oppressed, tradition-bound, and inferior, but secretly—beneath the veil—'just like me': i.e. fashion-loving, rebellious, and sexually-free.